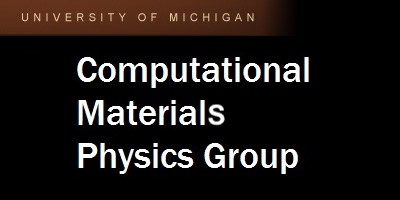 Our group aims to develop computational and mathematical techniques to address various aspects of materials behavior, which exhibit complexity and structure on varying length and time scales. Our work draws ideas from quantum mechanics, statistical mechanics and homogenization theories to develop multi-scale models from first-principles, which provide insights into the complex behavior of materials. 08-04-2018: We have announced the open-source beta release of DFT-FE code, which has been under developement for almost three years in the group. 01-01-2018: Paavai Pari joins group. Welcome! 09-01-2017: Krishnendu Ghosh joins group. Welcome! 01-01-2017: Nathan Vaughn joins group. Welcome! 09-01-2015: Chih-Chuen (Ian) Lin and Nelson Rufus join group. Welcome! 04-01-2015: Phani joins the research facutly at UM as Assistant Research Scientist in ME. 09-16-2014: Phani defends his thesis. Congrats! 04-28-2014: Ram defends his thesis. Congrats! Joins ORNL. 04-07-2014: Mrinal defends his thesis. Congrats! Joins Intel. 05-01-2014: Phani Motamarri receives the 2014 Robert J. Melosh Medal. Congrats! 01-17-2014: Bala defends his thesis. Congrats! Joins UCSD as a post-doc. 09-01-2013: Sambit Das and Bikash Kanungo join group. Welcome! 03-01-2013: Phani Motamarri receives Rackham Predoctoral Fellowship. Congrats!